You sit at your desk, click around the internet, and type away. Then you take out your smartphone to check messages and social media. You swipe your badge to maneuver around the building. But when was the last time you cleaned all these items? Technology has become a constant companion in our modern world. We’re connected almost 24/7 to one gadget or another. We keep our desks tidy, we wipe down counters, and our office attire gets washed regularly. But so many of us never consider cleaning our devices. We here at CBT Nuggets wondered just how dirty our technology and other tools really are. So, we had a team do some bacteria swabbing of typical items used in an IT office. Get ready to head out for cleaning wipes, and read on to find out why you’ll want to. There are certain everyday items that we consider dirty, including toilet seats, money, and things that end up in Fido’s mouth. And indeed, those items do host plenty of germs. However, the technology we use constantly is also home to grubby bacteria, including our cellphones. 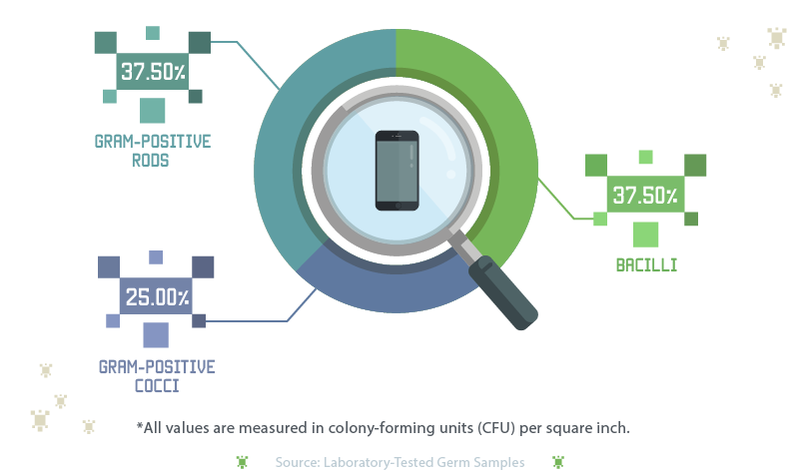 We compared several surfaces commonly used in a tech office and everyday “dirty” items to gauge how much bacteria are really lurking on our tech. We discovered that the most bacteria-laden item of all was the ID badge, which had 243 times more bacteria than a common pet toy! The cleanest item on our tech list: a laptop trackpad. 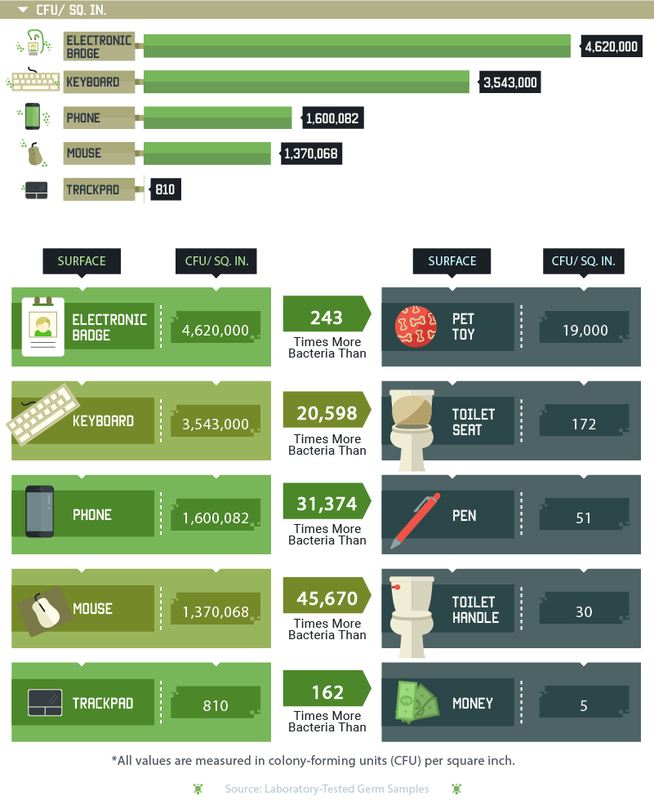 There are several common bacteria that have found their way into our lives and onto our gadgets. These include bacilli, gram-positive cocci, gram-positive rods, and gram-negative rods. Bacilli and gram-positive cocci tend to cause the most sickness. In fact, bacilli are the usual culprits in food poisoning. Gram-negative rods aren’t so great to have around either because they can be resistant to drug and antibiotic treatments. 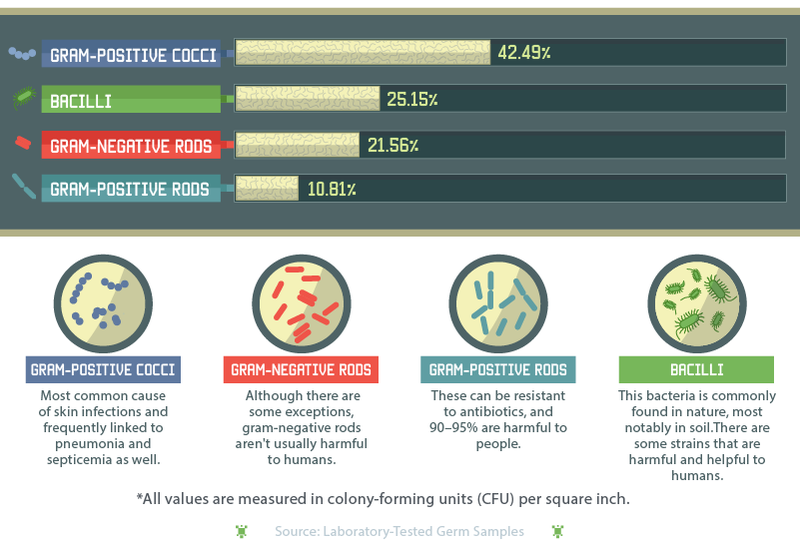 The only common bacteria that isn’t typically harmful to humans are gram-positive rods. Gram-positive cocci were the most common bacteria found, at just over 42 percent. These bacteria are behind strep and staph infections, so it may not be one you want to have regular contact with. The next most common bacteria we found was bacilli (around 25 percent), which can survive in extreme environments. Gram-negative rods came in at 21.5 percent, while gram-positive rods only made up about 10.8 percent of the bacteria present. It might be safe to say that illness could be lurking at your fingertips. Our bacteria swab results showed they harbored some pretty nasty guests. This is likely because Since we don’t think about them often, nor do we tend to think of them as getting dirty. You may want to get those germ wipes ready. Here’s the breakdown of bacteria we found on ID badges. At 61 percent, gram-positive cocci were the most common bacteria found on the badges, possibly carrying your next strep or staph infection. The next common bacteria found on the badges were bacilli (nearly 26 percent). The final foe discovered was gram-negative rods, at about 13 percent. The largest group of bacteria present was gram-positive cocci. It comprised almost 38 percent of the bacterial makeup. Gram-negative rods weren’t far behind, with 34 percent. 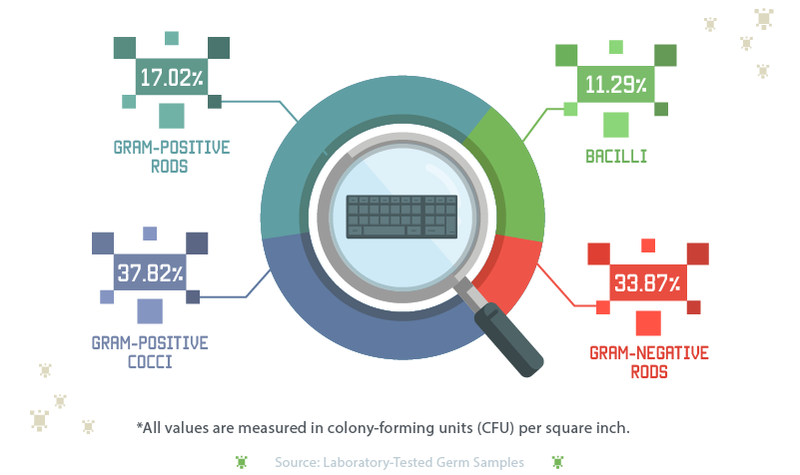 Gram-positive rods made up 17 percent of the total bacteria on keyboards. Bacilli came in at almost 11.3 percent. It seems to be a good mix of nasty germs on that keyboard, ready to send you home with the flu. Our swab revealed an almost even mix of bacteria. From what we found, a majority of the bacteria were bacilli (37.5 percent) and gram-positive rods (37.5 percent). A final quarter of the bacteria were gram-positive cocci. It might be a good plan to establish a cellphone cleaning routine and stick with it. Your immune system will thank you later, and your employer will appreciate you not using all your sick days. Do you prefer using a trackpad or an external mouse to navigate on your computer screen? Everyone has a preference. But perhaps you might be interested in knowing about the bacterial content of both. 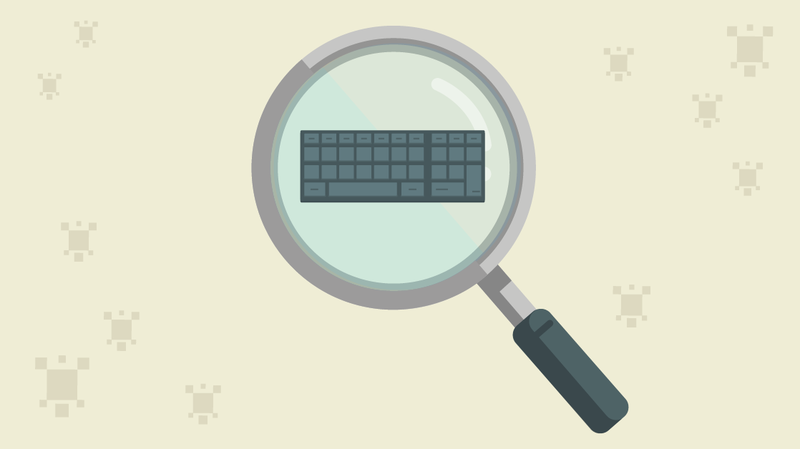 Just like your germy keyboard, a mouse tends to be covered in bacteria. You don’t think much about touching a public work surface, clicking your mouse to pull up a boss’ email, and then unwrapping your sandwich at lunchtime. But you might want to think twice. As it turns out, the trackpad was only harboring two kinds of bacteria: gram-positive rods (nearly 67 percent) and gram-positive cocci (33.3 percent). The mouse, on the other hand, contained all four kinds of bacteria. Bacilli and gram-negative rods made up 44 percent of the makeup each. Gram-positive cocci came in at 12.4 percent, while there was a small trace (0.01 percent) of gram-positive rods. Both the trackpad and mouse play host to some nasty germs – but the trackpad may just be the winner here. Your office at work is indeed a dirty place. It might look clean on the surface, but hiding on your commonly used devices is a whole host of bacteria. Many of the items that we touch and use on a daily basis aren’t cleaned regularly. Most of us just don’t think about it as we hurry through our busy days. One important way to combat all these germs is to wash your hands regularly and properly. The CDC calls handwashing a “do-it-yourself” vaccine, which tells you how important it is. To effectively keep bacterial counts low, regularly clean and wipe down gadgets and surfaces. If you know you’re getting sick, just stay home until you’re well again. By coming to work, you are spreading all those germs throughout the workplace and putting everyone else at risk. But don’t let these germs get in your way of sharpening your IT skills. You can train from the convenience of your home with online courses from CBT Nuggets. So the next time you go to put on your ID badge or type up an email, ask yourself if you’ve cleaned them recently. You’ll be grateful you did when flu season comes around. Start your free week with CBT Nuggets today! 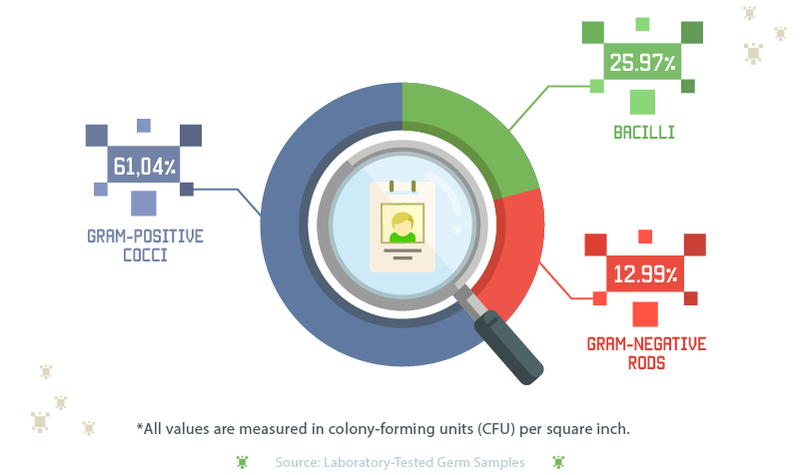 We swabbed five items within each category to find the average colony-forming units (CFU) per square inch on each surface. All testing was done by EMLab P&K. Fair Use Statement: Bacteria can be gross, but there’s nothing yucky about sharing our content. All we ask is that you attribute back to our scientists (or authors of this page) by giving them proper credit.